A great turnout once again for Norfolk Angling Club with 20 anglers eager and keen to fish Sheringham promenade, not an easy venue to fish with previous matches giving plenty of blanks, but a great venue to learn scratching techniques and it can also throw up some surprises. Fishing a flooding tide up to high water, we pegged left and right up to and just past the lifeboat station, with 3 to 4 anglers per bay. From the off we knew it would be a tough one but hoping for the odd flounder and a possible dog towards the end of the match. Tactics varied but for those who have successfully caught at this venue would no doubt draw on experience and not fish at a massive distance as the fish can be very close in. Out of the 20 anglers who fished only 5 blanked which is a good result in itself, but top honors went to Dave Mathers clinching his first podium spot with 3 fish for 2lb 8 2/3oz, including a cracking flounder of 39cm closely followed by one of 31cm, when this large specimen came ashore it was very light and was debatable if it was indeed a plaice, however photos later in the evening showed it was a flounder, well done on a cracking catch. 2nd place went to Andy Andrew Turk who was up past the lifeboat station on a good area of this stretch and he managed to winkle out 4 fish for 1lb 6oz, finally 3rd place went to Simon Bone who also found a specimen for our coastline in the shape of a 38cm Coalfish and two others giving him 3 fish for 1lb 5oz. A great match with the usual friendly banter and great to see newer members getting in the frame. 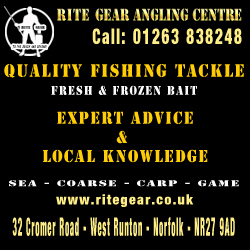 Next weeks match is at Trimingham and is a pairs match, if you do not yet have a partner and wish to fish please let us know. Book in via the shop please. A Committee meeting has been scheduled for Tuesday 9th March at the village in 7pm please let Simon Bone know if you have any issues to bring up or if you cannot make it.